Snake Disease Found in Ga.
A rare grass likened in Georgia to a Holy Grail of plants – part history, part mystery – has been found. 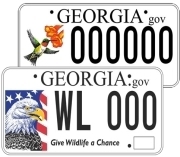 And it has been found in numbers that could make Georgia a cornerstone for conserving the species. 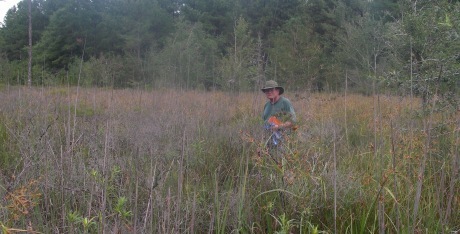 On Aug. 7, a Delaware Department of Natural Resources botanist who is an expert on Hirst Brothers’ panic grass re-discovered the plant while searching for it in Sumter County with DNR botanist Tom Patrick. 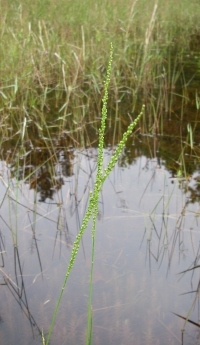 Dichanthelium hirstii, a candidate for federal listing, had been documented in Georgia only twice before: in 1900 and 1947. Bill McAvoy of Delaware’s Wildlife Species Conservation and Research Program said it was his last day to look for the grass in Georgia this summer, and almost the last site checked. “I was very excited,” he said. And not only because this species associated with limesink ponds had been known to exist in only five meager populations in Delaware, New Jersey and North Carolina. But because McAvoy and Patrick estimate the private land site in Sumter County has as many as 500 plants. 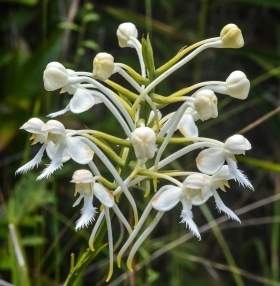 Read DNR’s blog post about finding Dichanthelium hirstii. 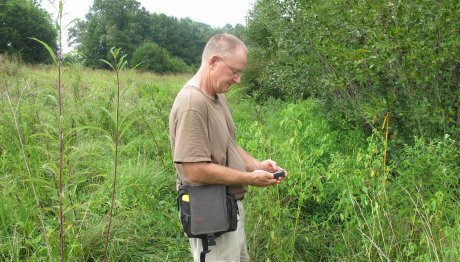 Miss the news on grassland restoration and Bachman’s sparrows at Joe Kurz WMA? Find it here. Also: Remembering one of the Hirst brothers, and another botanical discovery. 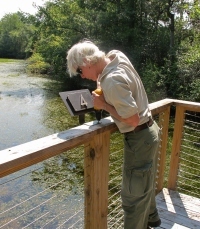 Botanist Bill McAvoy also visited Drummond Swamp in Bartow County to see the world’s only known population of Georgia alder, Alnus maritima subsp. georgensis. The plant is one of three subspecies of Alnus maritima, or seaside alder. Each subspecies is in a different state, one in Georgia, Delaware and Oklahoma. Georgia alder is being petitioned for listing under the federal Endangered Species Act, and is among hundreds of species being reviewed as part of a lawsuit settlement with the U.S. Fish and Wildlife Service. The white-nose syndrome of snakes? The head of the mud snake looks crusty and scarred, as if the animal has been burned. One eye is dull white. Scales along the snake’s body are dry and sloughing off. 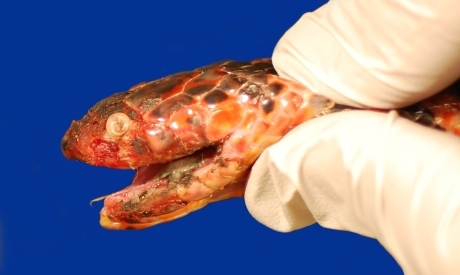 Snake Fungal Disease is not pretty -- not for one snake, and possibly not for populations of them. The disease which some scientists have compared to white-nose syndrome, killer of an estimated 5.7 million bats in the U.S., was documented last month in a wild snake in Georgia. An emaciated mud snake found by an Orianne Society volunteer in Bulloch County tested positive for Ophidiomyces ophiodiicola, a fungus consistently associated with Snake Fungal Disease. 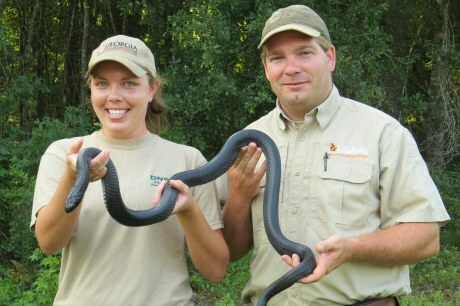 That’s the first free-ranging snake in Georgia the Southeastern Cooperative Wildlife Disease Study has confirmed with Oo. First reported from a captive black rat snake in Sparta, this disease marked by severe dermatitis has turned up in growing numbers of wild snakes in the eastern and midwestern U.S. since 2006. The impact on wild populations is not clear. Yet, Snake Fungal Disease was implicated in a 50-percent decline in an imperiled population of timber rattlesnakes in New Hampshire. Comparisons to white-nose are spurred by that potential, and by similarities between Ophidiomyces ophiodiicola and the white-nose fungus. Because mud snakes are so secretive, senior wildlife biologist John Jensen suggests the Georgia case could point to another troubling factor – the ease at which this disease spreads. Get the latest news on Georgia bats in a program set for 7 p.m. Sept. 5 at Black Rock Mountain State Park, near Mountain City. Trina Morris, bat research coordinator for the Nongame Conservation Section, will discuss conservation efforts and demonstrate how biologists net and survey bats – all part of the Georgia Bat Working Group Bat Blitz that will use Black Rock as a base for surveys Sept. 4-7. Bat watchers who are monitoring roosts for DNR's summer survey are reminded to send in their monitoring forms (the second survey window ended July 30). And for Georgians who would like to help conserve bats, late summer is prime time to put up a bat box! Getting around the McLeod's Bridge Tract at Ohoopee Dunes Wildlife Management Area is easier and more educational since interpretive and directional signs were installed along a new 1.8-mile interpretive trail. Workers included DNR staff and members of Southeastern Technical College’s Forestry & Wildlife Club. Summer isn’t over but that hasn’t stopped DNR from starting fall shorebird surveys. These surveys, the first of about 40 per migration season, are part of a regional effort to track declining species of five shorebird species and improve range-wide population estimates (“Counting shorebirds – across the continent,” Sept. 6). Shorebirds will have their 24 hours of fame during World Shorebirds’ Day Sept. 6. In Georgia, Little St. Simons Island will team with Coastal Outdoor Adventures and the Nongame Conservation Section for a shorebirding workshop and tours of beaches and the Altamaha River delta – with 10 percent of proceeds dedicated to the Georgia Nongame Wildlife Conservation Fund. Science teachers in Georgia, it’s not too late to apply for a $1,000 grant from the Nongame Conservation Section. Funded by the agency’s friends group, The Environmental Resources Network, the grant will be awarded to a third-, fourth- or fifth-grade public or private school teacher who demonstrates exceptional energy and innovation in teaching life sciences. Deadline to apply is Sept. 15. Three pairs of juvenile red-cockaded woodpeckers will be moved this fall from Fort Stewart to Silver Lake Wildlife Management Area, near Bainbridge. The work of the Southeast Cooperative Red-cockaded Woodpecker Translocation Project, relocating the endangered woodpeckers from robust populations to small ones with adequate habitat has been a key tool for growing the overall population and helping smaller populations reach self-sustaining levels. 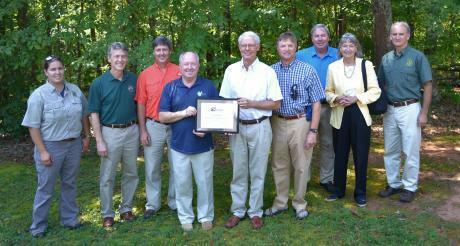 Names in the news: TERN members including President Brock Hutchins and Nongame Conservation Section staff recently celebrated the selection of Greg Greer (center/left, with plaque) as Outstanding Volunteer of 2014 (“Working with wildlife is Greer’s life,” Aug. 11). Sept. 13 – Georgia Naturalist Rally, Stone Mountain Park. Sept. 25 – Georgia Prescribed Fire Council annual meeting, Tifton. Sept. 27 – Help plant native wildflowers at grassland restoration site (as part of State Parks Day), Panola Mountain State Park, Stockbridge. Call to pre-register, (770) 389-7801. Oct. 3 – Outdoor Learning Symposium, Environmental Education Alliance of Georgia, Chattahoochee Nature Center, Roswell. Oct. 16-18 – 36th annual Gopher Tortoise Council Conference, Chehaw Park, Albany. Oct. 21-24 – 10th Biennial Longleaf Conference, Ninth Eastern Native Grass Symposium and National Prescribed Fire Council meeting, Mobile, Ala.
plus Georgia's native plants and natural habitats.